Explore our seasonal camps for children ages 2 – 13 and let us immerse your young explorers in the incredible world of Phipps. Highlighting ecology, conservation, healthy living and art concepts through hands-on activities, each session includes nutritious snacks and take-home crafts. To learn even more, please call 412/441-4442, ext. 3925. Consent Forms: Attending a camp? Remember to complete and submit your consent forms. 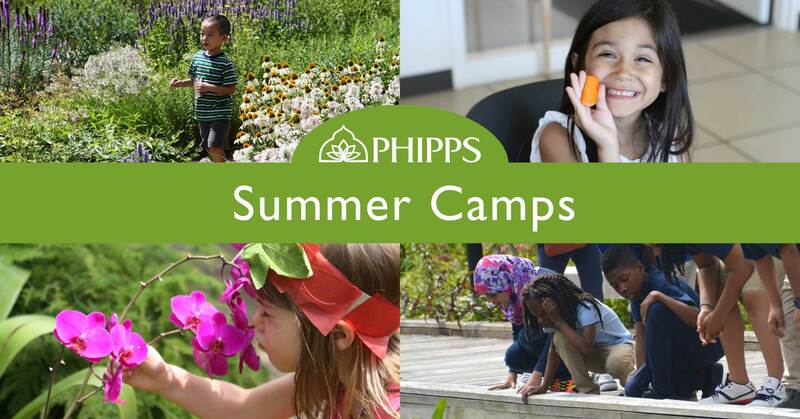 These full-day programs immerse campers in the world of Phipps for a week of scientific discovery and include a healthy lunch program with Let's Move Pittsburgh. These four-day programs for our youngest visitors explore fun topics including wonderful worms, fairy tale gardens and superhero bugs. July 29 – Aug. 2 | 8:30 a.m. – 4 p.m. Dive into conservation biology and learn about wildlife, plants, soil, water, and more. Plus use the scientific method to conduct hands-on research, and connect with local scientists every day! As a part of the Let’s Move! Pittsburgh Lunch program, campers will learn about healthy and sustainable cooking, and one complimentary lunch is available daily. Campers are also welcome to bring a lunch from home. Our week-long camps for early school-age children use awesome activities to strengthen connections to nature. These week-long programs for ages 6 – 8 go into depth on pollination and garden-to-plate concepts through fun activites. Meet the staff who design and facilitate our programs for children at Phipps. Keep up with the latest news on science education and research by following our blog.